Please place your order via phone or email, thank you. 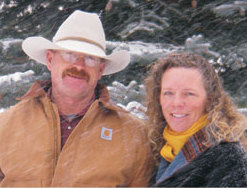 The first thing you should know about Keith and Wendi Lankister, owners of Bar Double L Beef, is that we are seriously passionate about what we are doing. We are blessed to live in a beautiful corner of God’s creation, raising and home-educating three healthy, happy, and energetic daughters. We truly enjoy our vocation as ranchers, even though some days on the ranch are better than others. We constantly look for ways to improve our management without fighting nature. Sustainability… that great buzzword, only comes when management decisions are environmentally, economically, and socially sound. There is a growing number of people who want to know where their food comes from, and even who is raising it. You may find it interesting to know that we, also, enjoy knowing where the food we raise is going and who is enjoying it! So when the good ol’ Wyoming wind is howling and we have wind chills below zero, or there is a rattlesnake in the path to the barn, or Keith gets bucked off his horse while chasing an ornery bull, or… okay, I’ll stop now. But when things aren’t running smoothly, we don’t wonder for long, "Why are we doing this?" We know we are doing this because we are providing a wholesome, delicious dinner for our neighbors. That is…you. It’s a great slogan, but it’s more than a slogan. We really believe it! When you buy local, you really do eat better. When you look at how far our food travels these days, it’s amazing. Now, local can mean different things for different foods. Oranges don’t grow well in Wyoming. But oranges from Florida are more local than oranges from Argentina. Beef grows well in Wyoming! When you buy your beef from your neighbor (that’s us) who is willing to put their name and reputation on that beef, don’t you suppose that beef is going to be better than "brand x" that came from an overcrowded feedlot possibly two or three states away and was "wet-aged" in the vacuum bag for three days between the packing plant and the grocery store? (Don’t get me started!) Our beef contains no antibiotics or added hormones, and is raised on sustainably managed pastures. We have an open-gate policy about our production practices. You can read the information about us here, you can call us on the phone, send us an email or even come and visit the ranch. Don’t forget the other benefits to buying local! When you buy our beef you are not only supporting our family ranching business, but all of the local businesses that we patronize. Our success, which comes from you, also allows us to contribute in other ways to our local community through donations of time, money or products. 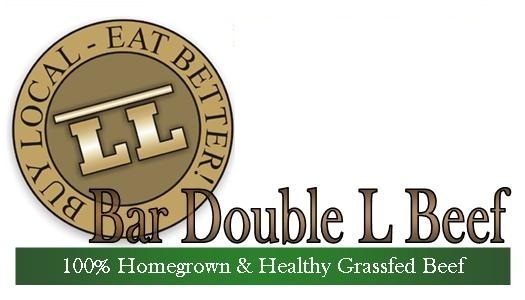 Bar Double L Beef is tender, healthy, delicious, and locally raised. Now that’s eating better. We invite you to taste the landscape that we call home. The Lankister family is proud to provide our neighbors with delicious, tender, healthy grassfed beef. If you ever have any questions about what we do or why we do it, we are just a phone call or email away.